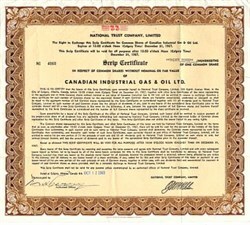 Beautifully engraved certificate from the Canadian Industrial Gas & Oil Ltd. issued in 1965. This historic document was printed by Grant-Mann Lithographers and has an ornate border around. This item has printed signatures by the Company's Authorised Officer and is over 39 years old.